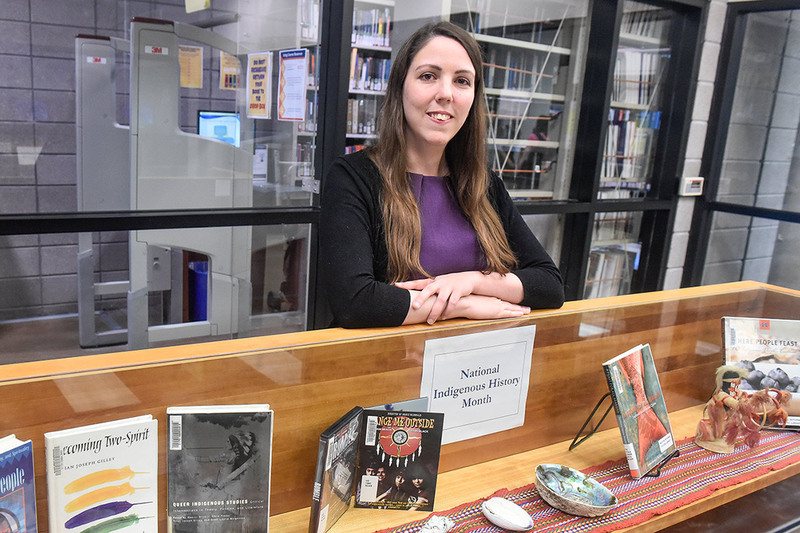 When it came to discovering more about her family’s Indigenous roots, Sarah Guay, a liaison librarian at the University of Toronto Scarborough, approached the journey with the same passion and determination that she brings to her job. Earlier this year, Guay registered as a member of the Bonnechere Algonquin First Nation after a lengthy two-year verification process made difficult by lack of documentation – a challenge Guay didn’t allow to hold her back. After being hired full-time at the U of T Scarborough Library, she learned that she is the first librarian there to identify as Indigenous. “It’s very exciting to be the first, but for me this is also still very new,” she says. As an undergraduate student, Guay really enjoyed seeking out and pursuing a research topic. That love for research serves her well as a liaison librarian for psychology and biological sciences. In her role, Guay teaches students about the process of research projects, library tools that support research, and how to think critically about the use of information. It’s with those skills that Guay started the process of learning more about her family’s Indigenous heritage. Guay’s lineage is traced through her Algonquin grandfather, who died before she was born. His death and a house fire saw most family documentation destroyed. Still, growing up, and especially in recent years, Guay wanted to know about her grandfather and his culture despite reluctance among some family members – a reluctance she says was due to stigma and lack of awareness. “I grew up very much from a place of white privilege, with no experiences or insight into the Indigenous piece of my history and culture,” she says. Cousins helped connect the missing dots as Guay slowly, but surely, put together the pieces needed to register with the Bonnechere Algonquin First Nation – an official recognition of her family lines. Guay says being officially registered makes everything real and brings her closer to knowing more about her grandfather’s side of the family. “It’s just the first step. I feel like I have a tangible connection and from here I can start gaining more knowledge, building those connections,” she says. Guay says that even though on paper she’s Indigenous, she’s careful in navigating what that means, especially as someone who just recently began self-identifying as Indigenous. “I don’t have the knowledge or insights that others who have experienced the hardships and persecution of being Indigenous go through,” she says. Guay, who holds a master’s degree in library and information science from Western University, is also a web librarian, meaning she maintains the library’s website through user experience research and observing best practices around writing for the web. It essentially combines Guay’s passion for technology and psychology. “It’s literally the perfect job for me,” she says. As she continues on her journey, Guay says she looks forward to participating in more Indigenous programming at U of T, and the U of T Scarborough Library specifically. Following the calls to action by the Truth and Reconciliation Committee in 2015, the university’s Truth and Reconciliation Steering Committee released a final report that included 34 calls to action. They include more Indigenous spaces, faculty and staff, curriculum, research ethics and community relationships, students and co-curricular education, among others. U of T Libraries have embraced these calls to action. In recent months the U of T Scarborough Library, for example, has partnered with Indigenous communities and initiatives through book showcases, art installations and student collaborative events such as the Indigenous film series. “There are definitely things happening, and I look forward to seeing how I can learn and be involved,” says Guay.